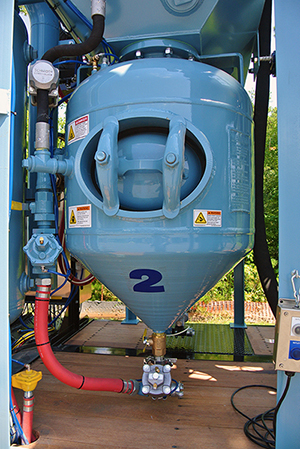 The 10 Questions to Ask Before Choosing an Abrasive Recycling Unit | Atlantic Design, Inc.
greater safety, and consequently a better bottom line. ALL PHOTOS: © ATLANTIC DESIGN, INC.
Buying an abrasive recycling unit is a big endeavor. Becoming familiar with the design pros and cons of the main components can make the process easier. If you know what questions to ask going in, you should be on your way to making educated decisions that will ensure a successful and profitable job. The following 10 questions are a great place to start and can be used as a guide. 1. Which size and type of pots should I get? Individual pots with one outlet are much easier to use than bulk pots or small pots with two outlets. Pot pressure rating should be 150 psig or higher to safely handle the higher-pressure air compressors common today. You never want pinch valves. Never! They are rarely used anymore, but to be safe, you should always ask. Normally closed, tungsten carbide grit valves provide a much safer and more accurate method of abrasive flow. Individual pots with one outlet are much easier to use than bulk or two outlet pots. You want pots that get the greatest amount of grit in and out. Depending on the shape and arrangement of the top head, the “working volume” can vary by 50 percent or more in similarly sized blast pots. Convex top heads, or heads which bulge up, will have a 90 percent or better fill rate, meaning 90 percent of the rated volume of the pot is usable. Conversely, concave top heads, or heads that push down, can lose 50 percent or more of the pot’s usable volume. (To understand usable volume in terms of time, a 36-inch pot with a convex top head can blast up to two hours, while a 36-inch pot on the same machine — but with a concave top head — will blast less than 30 minutes at the same settings. )Also, cone bottom pots, where the cone tapers down to a point at the outlet, provide near-empty discharge of the pots. You DO NOT want dish bottom heads, or cone heads with a 6-inch flat bottom, which (along with more than one outlet per pot) will cause grit to remain in the bottom of the pot and eventually clog the grit valves with clumps of old grit. You want at least 1.5-inch air piping and oversized air valves. The blast air valve should also be separate from the pot-pressuring valve. 2. Which size abrasive storage hopper do I need? Like blast pots, the usable volume of the storage hopper is affected by the design. Depending on how the abrasive is loaded and unloaded, similar-sized hoppers can have dramatically different working storage. Those that are loaded in the center, using gravity, cause the abrasive to make conical mounds in the hopper and subsequently lose 50 percent or more of the storage through unused space. However, an air-propelled, top-loading system, which creates an inverse, fountain shape, can use 90 percent or more of the available storage space in the hopper. More storage is always better, and we recommend holding 1 ton of abrasive per outlet per blasting hour. Calculate the actual volume based on the hopper load style to make sure it meets your abrasive volume needs. 3. Which size engine and vacuum do I need? The short answer is: The larger the vacuum and engine, the more powerful the system will be, regardless of the number of pots on the unit. However, you should be diligent in your research to make sure that a system’s engine and blower actually match what is advertised. A blower size might be given but the operating speed might not, which implies a vacuum size (max speed) when the actual blower speed is less than max. Or the motor or engine horsepower will not match the listed air flow. Also, just because an engine, motor or blower size is listed doesn’t mean that it is connected to drive the blower as advertised. Get the blower and engine information charts to make sure they match the stated speeds and capacities. For direct drives, find the engine running speed. On belt drive systems, ask for the sheave sizes and blower running speed. These charts are easy to read, and you can contact the engine or blower manufacturer directly if you have any questions. Getting this information will ensure the engine and blower speeds match the advertised performance of the machine and that the system you purchase can take full advantage of the capacities you are paying for. On a related note, ask for the size of the hose going from the vacuum dust collector to the vacuum. Many times, this hose is undersized to save costs, which will restrict air flow, hampering the unit’s performance no matter how large the engine and blower may be. 4. How should I connect my vacuum hose to the machine? The primary vacuum hose connection is where the whole reclamation process starts, and this connection experiences more wear and tear than any other point on the unit. Ideally, you want multiple connections of different sizes that are also low to the ground. Some units only have one inlet of a fixed size, while others offer multiple inlets — from three 4-inch inlets up to two 8-inch inlets, depending on the vacuum size. Air transfer vessels have fewer moving parts to worry about than bucket elevators and are more weatherproof. Most inlets also have a screening device to help remove larger debris. The inlet should never let the abrasive directly impact the screener but rather hit replaceable target plates — first to slow down the particles and then drop onto the screener. Some units have a hopper holding the screener, which provides the added advantage of holding abrasive. This provides more grit storage and allows for greater flexibility in balancing the vacuuming and recycling. 5. Which type of abrasive cleaning system should I get? Every system should process the abrasive through three types of cleaning: air wash or air cleaning, screening, and magnetic separation. A larger size screen and magnetic drum will clean faster and more efficiently. How is the grit transferred through the system? Getting a clear answer to this simple question will let you know right away if extra work may be required to protect the machine. 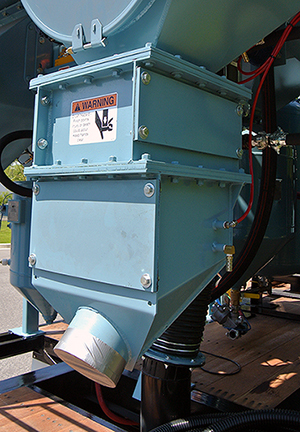 Bucket elevators/screw conveyors are one method; however, air transporters are able to more completely fill the hopper, have fewer moving parts to worry about, and are more weatherproof. Choose a tightly closed system which keeps moisture from reaching the grit. Some systems require keeping a tarp over the classifier and transfer devices to protect them from water. Do you plan to alternate between steel grit and non-magnet abrasive, such as garnet and aluminum oxide? If so, does the recycler allow for an easy switch between products? There are units available that easily make the transition between steel grit and other non-magnetic abrasives. 6. Which type of dust collector do I want? There are lots of factors, such as inlet size and location, to consider on a dust collector, but the air-to-cloth ratio is the most important starting point. The filter measurement is the air-to-cloth ratio, or the amount of filter area compared to the amount of air flow. The lower the number the better. Polyester filter cartridges should be 5:1 air-to-cloth ratio or lower, while filter bags should be 10:1 or lower. You want polyester filter media, as opposed to a paper or paper-synthetic blend, because it is the only material specifically designed and rated for successful dust collector use. For mobile equipment, because of the smaller size, a compact cartridge design is preferable to a bag. 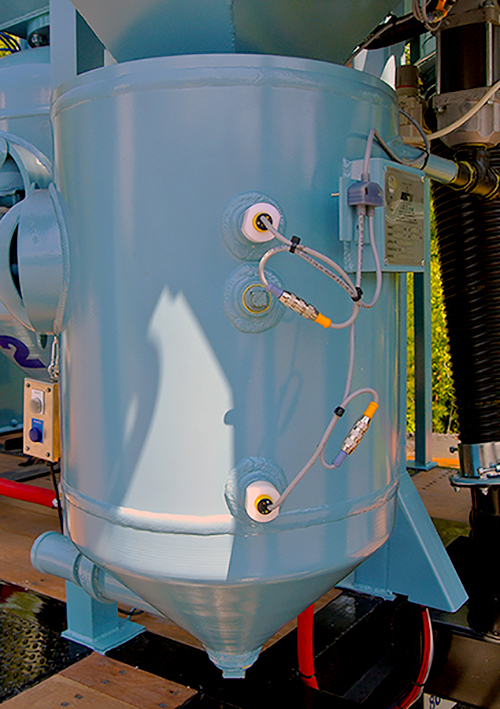 Double Dump valves provide extra discharge compartments which allows for true continuous vacuuming. 7. How should the dust and debris be discharged from the collector? The dust and debris discharge process is nearly as important as vacuum size. Manual valves, like butterfly valves, require the vacuum to be shut off for dust discharge. Depending on vacuum hose length, it can take up to 20 minutes to clear if the vacuum must be turned off for dumping. Butterfly valves are prone to leakage. A double dump, or double flapper type valve, allows for true continuous vacuuming. The extra discharge compartments let the dust flow automatically while vacuuming so you can really run 24/7 — needing to stop only to check the screens for trash, which can increase vacuum performance up to 25 percent.Where are the dust and debris discharges located? They can be on only one side; both sides; or just at the rear. Which arrangement you want will depend on your jobsite needs. It is best to choose a system with the easiest discharge access — typically on only one side or at the rear so you have flexibility to park or position the equipment without blocking the discharge.8. Do I want a vacuum deadman or vacuum breaker?Most systems will have a safety feature to stop or diminish the vacuum — similar to the blast pot deadman feature — for when an obstruction in the hose occurs.A breaker valve reduces the vacuum pressure by bleeding air into the line, allowing an operator to pull out something caught in the hose without fully stopping the air flow on that line. For the operator, this is not as safe as a full stoppage and it could also allow water to be vacuumed into the system.A deadman shutoff valve, however, completely stops or starts the air flow from the vacuum, which avoids possible operator injury and system damage.9. Which type and size compressed air dryer is best?Again, as a general rule, the larger the air dryer system, the better the performance. But like the other components, there is a lot of leeway with sizing descriptions, which can lead to having a properly sized dryer on paper but not in actual performance.Checking the size of the aftercooler is simple; ask for a copy of the manufacturer’s brochure. You always want a 15-degree approach. A larger approach number may cause water to build up in the system.For the desiccant tank, larger and taller is always better, and a single tank is better than a multiple tank even for the same size volume. Always ask for the total volume in the desiccant tank. Further, a desiccant tank that is completely galvanized, inside and out, will outlast a painted tank every time. 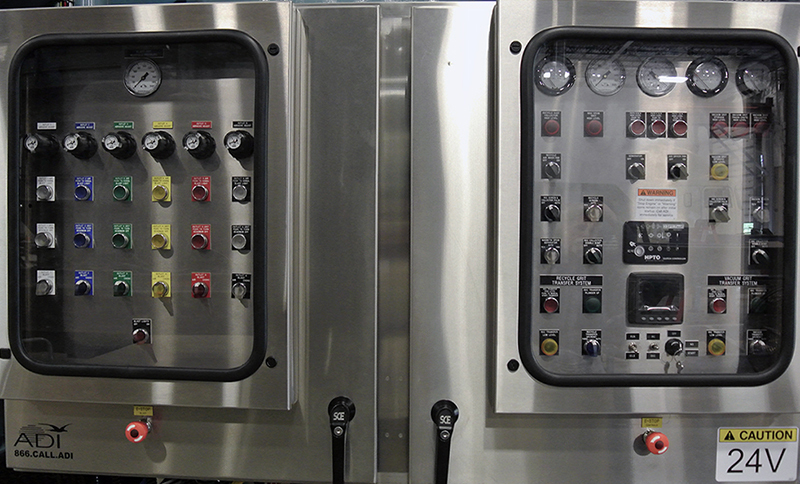 Adequately designed, low voltage (24vdc and lower) control panels are the safest systems for mobile use. 10. Which controls are the safest and easiest to use? You want low voltage controls (24vdc and lower) that are adequately designed — the simpler the better. Avoid high three-phase voltage whenever possible, as it is dangerous and only a trained and licensed technician should work on these systems. Central computer controls are not ideal, as one problem can bring the whole system to a standstill. A distributed control system, with independent controls for each component, is better for this type of industry. Look for systems with easy working access that can be manually bypassed when needed. You can also look for certifications like UL listed panels. UL certification means the panel is designed and constructed to adequate safeguards. Ask to see the voltage and UL listing of all panels. If you’ve done your homework and know the answers to these 10 questions, you can be confident that you’ve made the most informed decisions concerning your purchase. Getting the properly sized and functioning grit reclamation equipment will lead to less down time, greater production, greater safety, and consequently, a better bottom line. If you have any questions or comments, please contact us for further discussion. For a downloadable pdf of this story, click here.